The image of Indian feathers is often synonymous with Native American Culture. The indigenous Indians would collect the feathers of various birds, which were then used for different purposes like making headdresses, clothes, to decorate weapons and for spiritual purposes. The feathers of eagle particularly held a very important place in Native American Culture. The headdresses made through the use of different feather were known by distinct names. 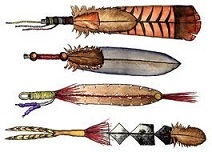 The symbolic meaning of different feathers and the purpose that they were used for varied from tribe to tribe. However, in all tribes certain feathers were revered. These Indian feathers particularly the eagle feathers are so important in the Native American culture that The American Constitution allows members of native communities to collect them while others are prohibited from doing so. Today you will find the designs of Indian feathers used in tattoos. These are usually coupled with other designs like birds and the dream catcher. You can also find several native Indian artifacts made with feathers of different birds in most memorabilia stores.